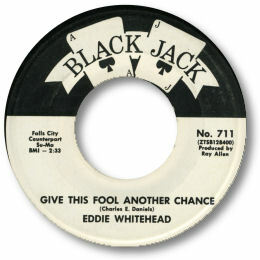 This is the best known disc on the Cincinnati Black Jack label (not to be confused with the Philly concern of the same name). Not of course for this excellent deep track but for the rather ordinary other side which Northern fans like and which has pushed the price for the 45 up to ridiculous levels. Eddie's version of Charlie Daniels' Give This Fool Another Chance has a classical southern soul mixture of organ, piano and chopped guitar behind which a finely wrought horn section adds weight and pressure to Eddie’s tuneful baritone voice. The bridge is particularly well done – nice chord changes and some great shuffle drumming. Now you don’t have to remortgage the house to hear it. White artist Billy Joe Young's cut of this great song laid down in 1966/7 and I would assume that the producer on both the sessions, Ray Allen, recorded Eddie's version around the same time. It certainly sounds like it to me. 1. The Billy Joe Young cut wasn't released at the time of recording, but can be found on the Westside UK CD "Soul Jewels Vol 1". 2. "Just your fool" can be found on the Kent UK CD "Northern Soul's Classiest Rarities" (CDKEND 192). Thanks to my friends Joe Sperry and Dante Carfagna (see Links) for the Charlie Daniels info, and to Matt Futerman for the Kent CD gen.